Kids and Water! They go together like peanut butter and jelly. When working in the garden with younger children, watering plants is an activity they will gladly take part in! When I ask, "Kids, will you please water the plants in this raised bed?" then I have gained a few moments to pull some weeds in a nearby area while the kids are watering. Even though watering cans are great, they are not always kid friendly. A watering can is heavy for children to carry and requires some skill to use without wasting water. Another downside is that the can empties quickly, and I often spend more time filling the watering can back up again instead of pulling those weeds! Unfortunately, garden hoses fall in the same category as watering cans. More often than not, children and hoses end up tangled together or an innocent party (or plant) accidentally gets knocked over. In a few more years, my grandkids will be old enough to move the hose through the garden on their own without incident. But until then . . . I have a garden hack that works beautifully with kids. 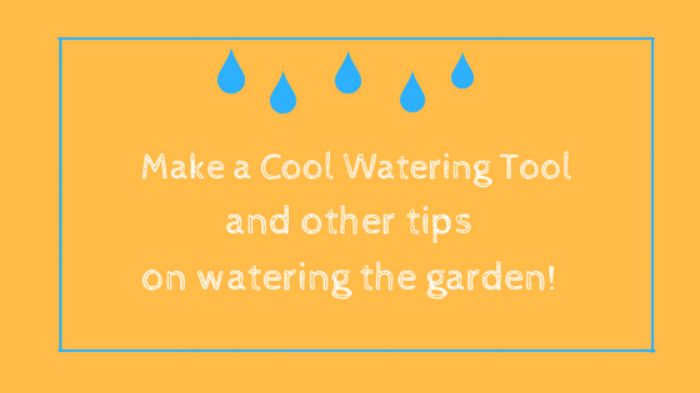 Watch the 2 minute video below for instructions on how to make this Cool Garden Watering Tool. Teach kids the best way to use water, our most valuable resource. Download a one page guide"Garden Watering Tips." It's free, and it will give you the basics of when to water, where to water, and how much to water. I hope you find the guide and video helpful!!! Now, watch the video below!